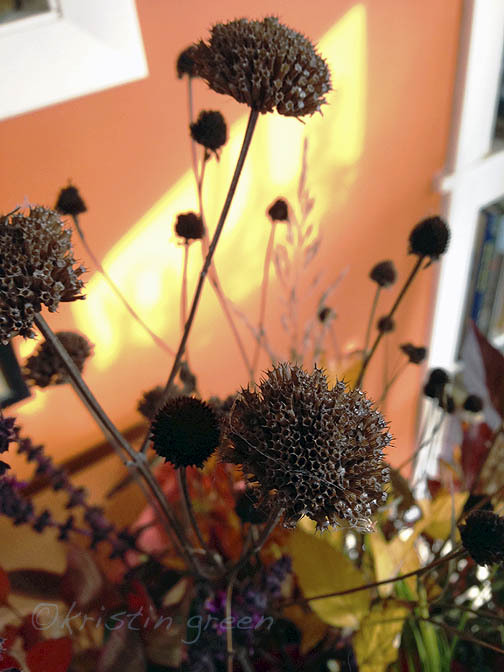 The late garden, so wild and wooly, tall and half gone by, is my favorite. (As always, I reserve the right to change my tune come April and over again May through September.) Seedpods of swamp milkweed (Aslepias incarnata) and butterfly weed (A. tuberosa) have split at the seams to release great clouds of silk capable of carrying their packages miles on a decent breeze. – I spotted some floating in Bristol harbor the last time I was out on the water. 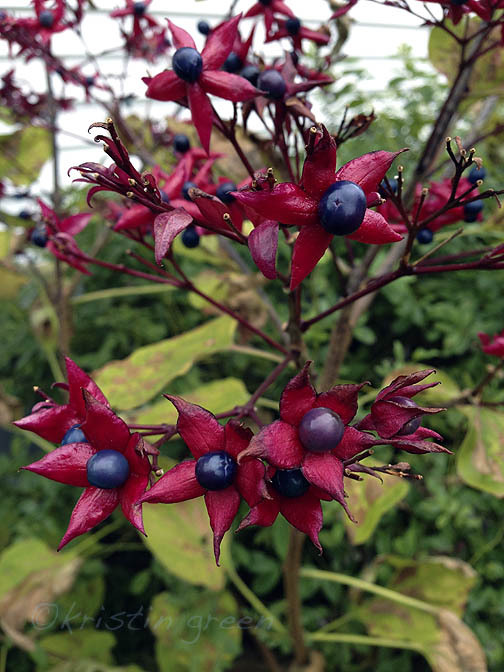 Harlequin glory bower’s (Clerodendrum trichotomum) lipstick-red bracts, which were so recently puckered around fragrant white flowers, have begun to display indigo-blue berries instead. I love the black eyes of black-eyed Susans much more now than when they were ringed in gold eyelashes. Meanwhile, dahlias, Japanese anemone, asters, and chrysanthemums offer fresh-as-daisy counterpoints to the seedheads and tatters of almost everything else. I allowed a weedy little white aster to grow in my garden. 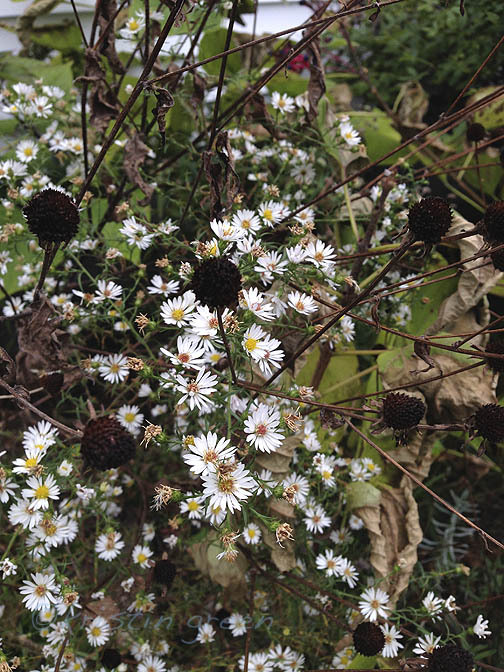 I’m sure it blew in and don’t know its name (might be hairy white oldfield aster, Symphyotrichum pilosum var. pilosum) but its thin stems and minuscule leaves and buds never annoyed me or got in the way, so I left it here and there, and I’m glad I did for the way its branches of fingernail-sized flowers hover like a lace veil over the garden’s shoulders. My favorite chrysanthemum, Sheffield pink, is a perfectly hardy old-fashioned perennial completely unlike the potted muffins offered at every roadside stand and nursery. I’m tempted daily by those but they can’t hold a jack-o-lantern candle to Sheffield pink. Its dusty apricot-pink petals are as long and lax as the plant’s stems and the whole picture is as graceful as a loose-limbed ballet dancer. Alas, the patch I started with has been crowded out of my borders, and I’m forced to enjoy it in others’ gardens. I also have to venture out to witness the spectacle of hardy begonia (Begonia grandis). 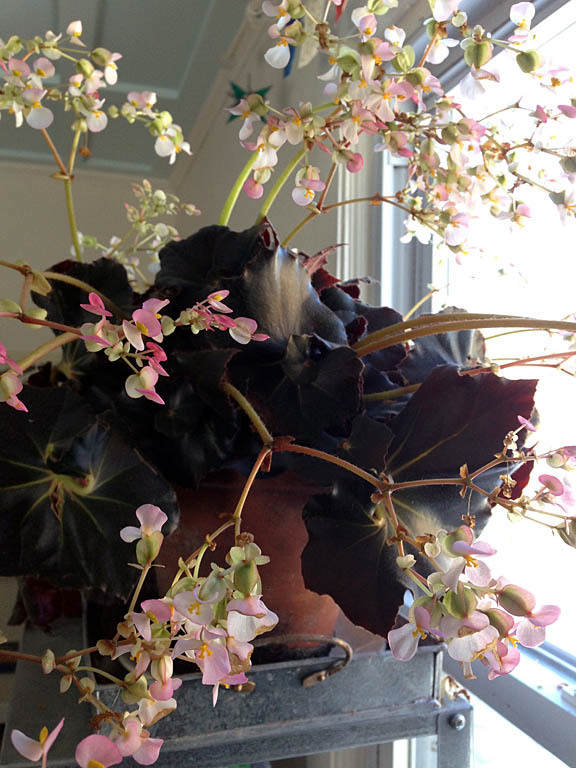 Those of us who decorate our living rooms with rhizomatous begonias can’t help but be enchanted by a begonia (tuberous in this case) that can inhabit our garden without requiring winter shelf space. We just have to be willing to allow it room, in moist-ish shade or a dapple, to grow without overwhelming competition from neighbors (impossible conditions to provide in my burst-seams garden). By the time it makes its presence known in late summer, lopsided heart-shaped olive-green leaves reversed in burgundy, will catch fall’s low sun to reveal deep red veins. Bazooka-pink, or more rarely white, dangles of clamshell flowers through September and October would almost be beside the point if they didn’t add to the plant’s appeal. Better yet, they go to winged seed, ensuring, when happily situated, generations of fall extravagance. Frost in the forecast is bittersweet. I’m not ready to let go of the season – it has gone too quickly as it always does. But I’m grateful for the warning to remind me to rhapsodize – and procrastinate – while I still have the chance. Have you had a frost yet? 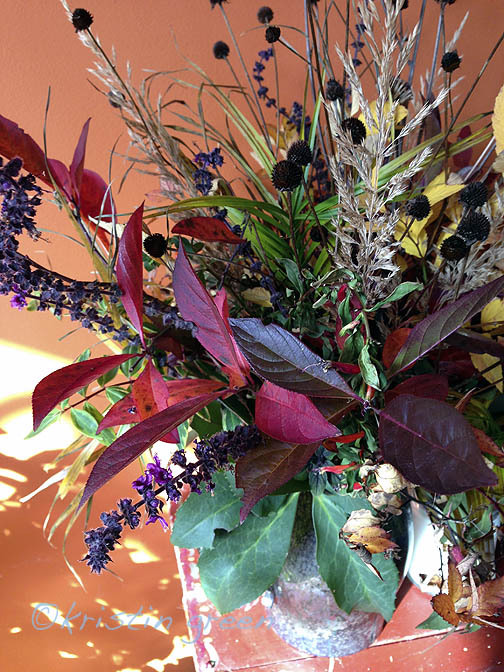 What are your favorite fall flowers? Originally published March 18, 2015 in East Bay/South Coast Life newspapers. I hope by the time you read this we can see our gardens again. I’m dying to get to work outside. If this were a normal March the hellebores would be blooming and I can see from my window that the witch hazel has unfurled its flowers again. But as I write this the snow bank that swallowed it is no less than knee high and I still look like Frankenstein tromping out to the bird feeder. I don’t trust that winter is over yet despite some thawing and a calendar that declared spring last Friday. (It snowed that day.) I was punished for my haste last year. Never again. (She says.) I’m sure I should at least wait until I can walk through my garden with a normal amount of poise and grace before I take loppers to the roses. So, like all of you, I’m going stir crazy. Thank goodness my begonias are in bloom. 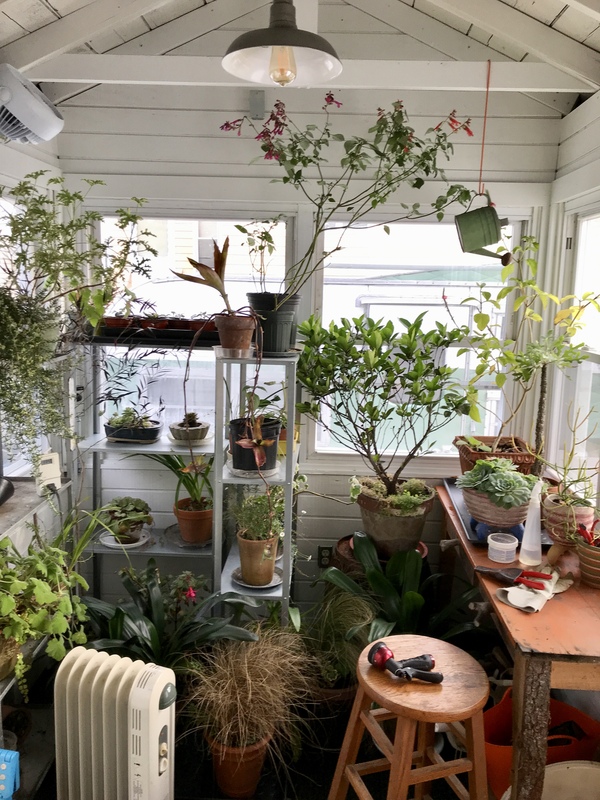 Of over 1500 species of begonia in the world (mostly from the tropics) only a fraction of a fraction are cultivated for our gardens and windowsills. I have far fewer than that and even fewer than I used to. For a long time my living room was dominated by a gangly silver polka-dotted angel wing begonia (B. maculata var. wightii). Angel wing or cane begonias have sturdy stems between pointed asymmetrical leaves and seem to want to be twelve-feet tall. Supposedly they can be pinched back to encourage compactness but mine was never satisfied unless it was reaching for the ceiling and arching like a vulture over the couch. I loved its patterning and profusion of white flowers but when it finally toppled to the floor I said my goodbyes. Most of my remaining begonias are rhizomatous types that grow in low mounds from a gnarly tangle of ground covering stems and bloom with winter-blues-busting exuberance. ‘Midnight Twist’ is a Gothic beauty with ruffled leaves as close to black as burgundy can get and sprays of bubblegum pink clamshell buds that fade to nearly white after opening. My other favorite has tiny green leaves with red freckles and eyelashes all along their edges, white flowers the size of baby fingernails, and grows with the kind of generosity that keeps me at my potting bench. I have one Rex begonia. Sort of. It’s barely surviving with half of a leaf and the start of another. 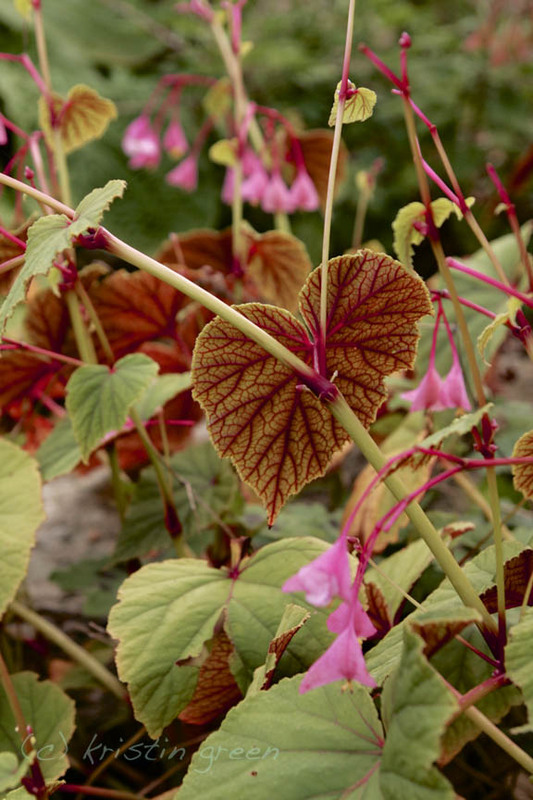 Rex begonias have rhizomatous parentage on one side but have been bred for who-needs-flowers? sort of foliage with Tim Burton-esque curlicues and/or silver, pink, red, burgundy, and green zones, splashes, and/or peach fuzz. They are extra persnickety and wear their hearts on their sleeves. For example, my Rex’s disappointment about low indoor humidity has been displayed for months in necrotic brown spots, leaf drop, and death throes. As a rule begonias want indirect light and to be watered only after the soil has had a chance to dry out and just before they start to wilt. Heaven forfend you ever leave them sitting in the overflow. Even though a few of my eyelash begonias thrive in terrariums it never occurred to me until I did the research for this that begonias need a lot more moisture in the air than they can tolerate at their feet. With any luck, my woe-begotten Rex will make a dramatic comeback now that it sits above a pan filled with water that will raise humidity levels as it evaporates, and enough pebbles to keep the pot high and dry. I have all but forgotten about the tuberous begonias in my collection. They do their blooming in the summer and spend the winter completely dormant in the dark down cellar. But they too, in their own way, will help pull me through the last stretch of winter because I should start checking now for new shoots that will want the light of day and a drenching to get growing again. This year they might know it’s spring before the rest of us do. 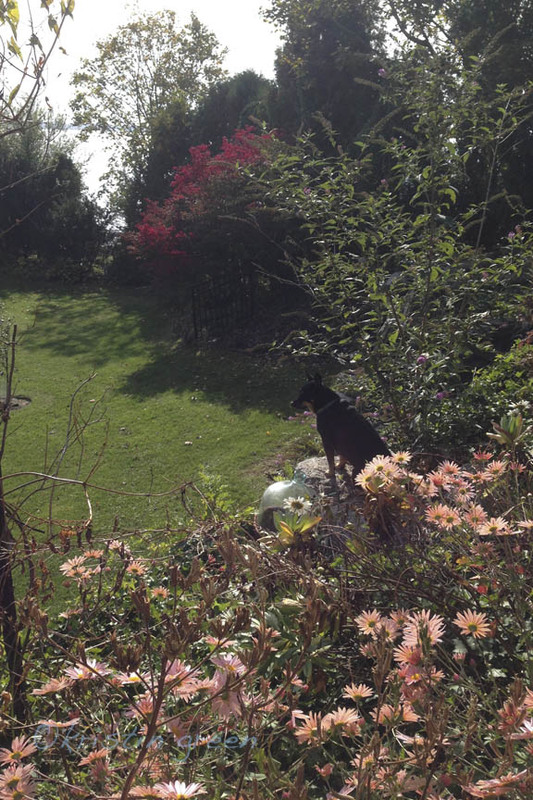 I’m happy to report that in the time since I wrote this, the snow has melted from most of the garden. I can get to the feeder without lurching and the witch hazel is only ankle deep in the stuff now. Huzzah! 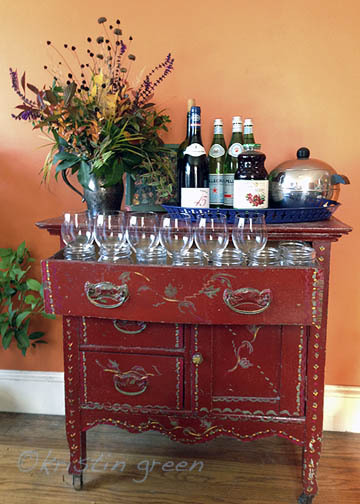 What is helping you through the (lack of) transition to spring? Itea virginica ‘Henry’s Garnet’ — hadn’t dropped its semi-prosh gems yet. Spiraea japonica — the leaves that are left are still golden/orange. Hellebore. I can’t remember which Lenten rose I have but its leaves will eventually need to be cut back anyway. Might as well enjoy them. Carex muskingumensis — palm sedge. Right on the edge of becoming sludge. Hypericum × moserianum ‘Tricolor’ — looks like it’s still growing. Calamagrostis brachytricha — Korean feather reed grass seedheads. Monarda fistulosa ‘Claire Grace’ — wild bergamot seedheads. 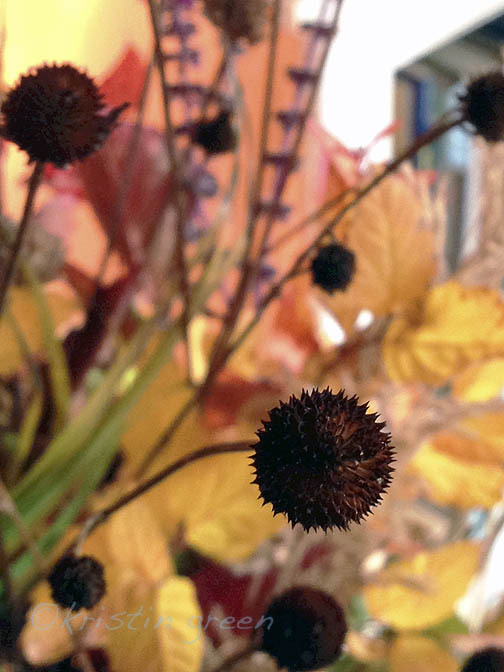 Rudbeckia triloba — brown-eyed Susan seedheads. African blue basil flowers from a plant overwintering in the plantry. Cuphea ‘David Verity’ flowers also from plantry resident. Despite Pigeon’s taste tests and my laziness about changing the water, everything has lasted four days now except the cuphea, which wilted after three. 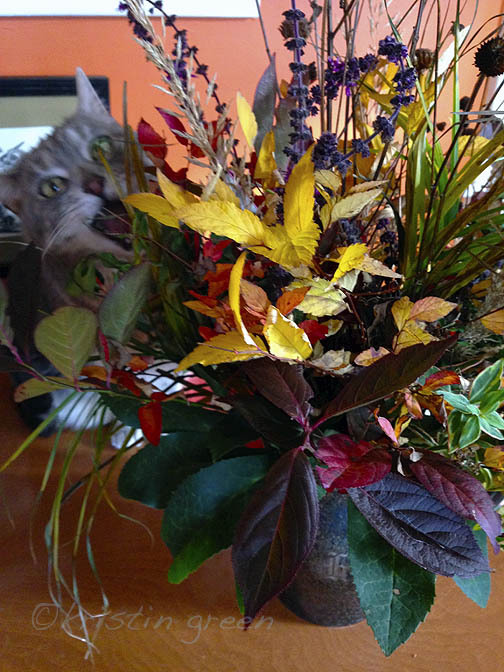 Were you grateful for local flowers and/or your garden this Thanksgiving?